After the rumours started early this year… This time, it’s for real. SMAP will disband on the 31st of Dec, 2016. Faxes have gone out to the media, it has been reported on NHK, it’s out in the newspapers and most importantly the breakup notice has been posted on the official JE website, Johnny’s Net.. It’s as official as official can be. 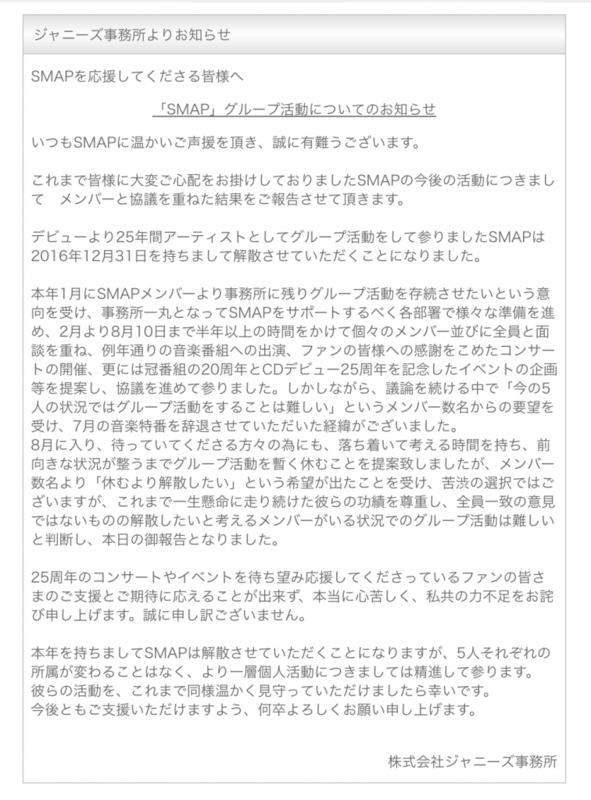 SMAP fan club notice – They will stop accepting new fan club members, as well as membership renewals. 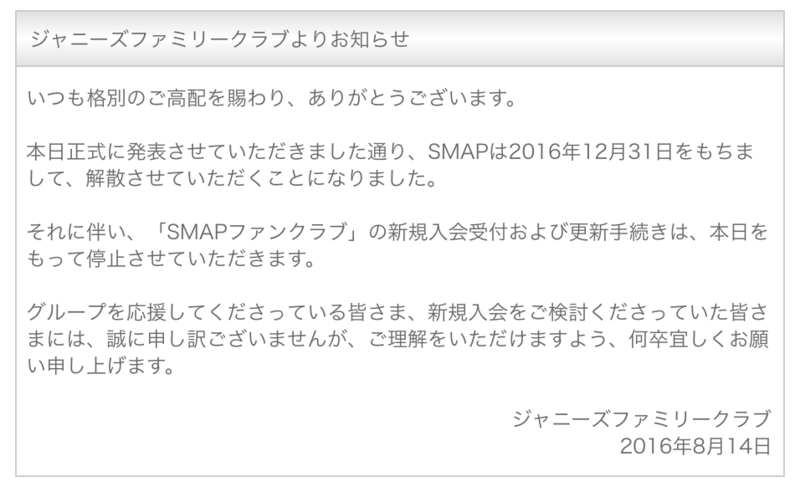 SMAP disbandment notice – SMAP will be disbanded on the 31st of Dec 2016. You can view the messages (in Japanese) yourself on their disbandment here, and on the closure of the SMAP fan club here. The SMAP fan club membership renewal and joining will be stopped as of 14th of August. SMAP debut on the 9th of September, 1991 with their single “Can’t Stop!! -Loving-“. They would be active for a total of 25 years. The last single SMAP released was “Otherside/Ai ga Tomaru made wa“. It was released last year on their 25th anniversary, 9th September 2015. The individual members will still remain in Johnny’s entertainment after the disbandment, and JE will support them in their individual endeavours. More information will be added to this post as the news unfolds. Wahoo, that’s still a shock!